I Ride I Recycle | Skateboard Recycling Movement | I RIDE I RECYCLE X PENNY ORGANIC SKATEBOARD IS HERE! 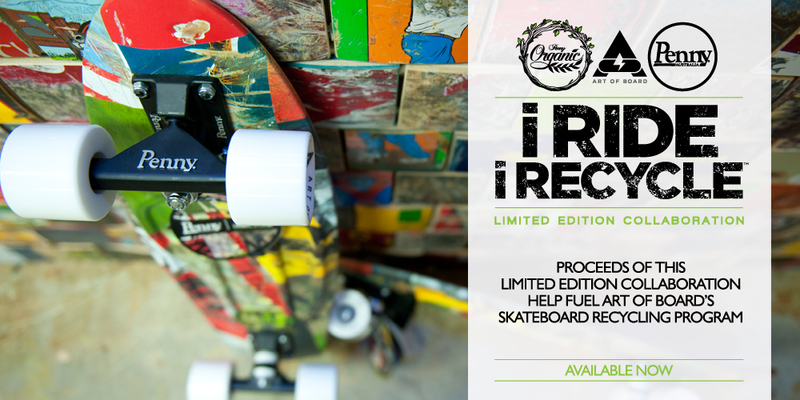 I RIDE I RECYCLE X PENNY ORGANIC SKATEBOARD IS HERE! We are so hyped to announce the launch of our limited edition Penny Organic “Nickel” skateboard. This Earth-friendly board contains a unique enzyme that allows the plastic to decompose at a faster rate than normal plastic when buried back into the earth. The graphic features our signature recycled skate tile pattern, and it’s our hope with this amazing collaboration to further spread the I Ride I Recycle message. Boards are now available for purchase in select U.S. skateshops and online HERE at Art of Board. For the story behind this collaboration, view the VIDEO CLIP.